A forecast for rain in the mountains and hot, dry, winds in Christchurch often has us thinking about Banks Peninsula tramping. And Packhorse Hut easily become part of most circuits. We drove over Dyers Pass and around Lyttelton Harbour to Orton-Bradley Park. It was mid afternoon so we parked outside to avoid being locked in later. We set off up the track to the Tablelands and further up, turned west on the track across the upper Loudon farm towards Packhorse Hut. We had a detour planned and weren't to be going directly to the hut. Honora had talked to Margaret Clark recently about a route she and Jim had once taken descending Mt Bradley. Honora wanted to check out their route in reverse. At the bushy stream we planned to follow the stream upwards to Mt Bradley. However the bush was too tangled and scrubby , so we sidled on out to the far side of it and just climbed the open tussock slopes to the ridge. It was easy travel that way. The weather was still warm on the top of Mt Bradley and we appreciated the steady breeze blowing across the summit plateau. Honora led off down the western ridge toward Packhorse Hut. The proper track descends in long zigzags well down the Kaituna valley side. But we took a more direct line and stayed on the ridge. We didn't travel on the very crest of the ridge, which can involve rocky outcrops, boulders and scrub. Instead, Honora picked a line slightly off to the Kaituna side. This was easy travel with only one steeper section, with a bit of dracophyllum scrub and rock slabs, to descend. Down at the Packhorse Hut we found Brian Smith, of the Peninsula Tramping Club in residence. He was there for the night with his brother and young nephew. It was 7.00 pm, and as we'd left the road at 3.00 pm we thought a late "lunch" stop was reasonable. So we stopped and chatted awhile. Brian provided some excitement too. His Coleman stove leaked some fuel and caught fire, whereapon he launched the flaming object through the door. With the excitement over, Honora thought it time to go. We headed off at 7.20 and took the track back around the Lyttelton harbour side of Mt Bradley. The sun was dropping quickly in the sky and we set a good pace to get back to the park's gates in exactly an hour and a half from Packhorse Hut. How easy it is for us to get exercise in wonderful open country so close to Christchurch. And it was a bonus to share some of the time with good company at the hut. Honora had been away for two weeks. We both had our own reasons to go for a walk to Packhorse Hut in the bleakest weather of the winter in 2001. A powerful southerly storm buffeted us as we drove out past Lake Ellesmere to the Kaituna valley. Squalls of sleet chased us up the valley to the carpark. We were alone on our mission. We took off quickly up the track. The manuka and kowhai trees lunged about in the wind as we passed through, but they gave us some shelter from its chill. Not so, higher up, on the open spur. The wind tore round us, lashing us with sleet, and bent us over. Our heads were down, our hoods pulled tight, as we rushed over the saddle to the the hut. It felt warm inside. Of course it wasn't. But we soon had hot drinks and food to warm us up. It was a good place to be, standing at the window looking out at the bleak scene. Low clouds stormed across Lyttelton Harbour in squalls, shutting out the view completely. I just watched the swirling tussocks instead. We stayed at Packhorse Hut until the wonderful winter wildness had wrought its magic and recharged our spirit. The walk back down to the valley had the bitter wind in our faces but it no longer felt a challenge. We couldn't have this sublime day taken from us now. One of the best ways to 'd0' the Koropuku is as a through trip including Townsend Hut in the Taramakau. 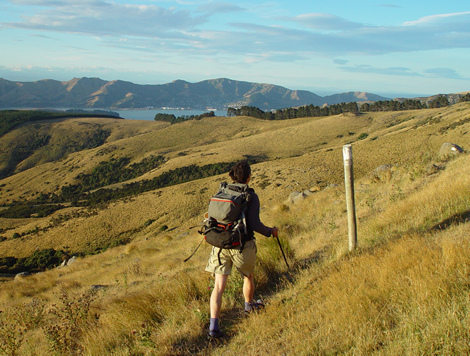 Crossing the ridge between Townsend and the Koropuku has no difficulty for the average experienced high-country tramper capable of their own route-finding, and with personal knowledge of weather conditions in this type of country. The route between Townsend Hut and Big Tops Hut in the Koropuku is marked on the map here in red and is only shown to indicate the general line of travel. It should not be used as a GPSed route. In good visibility the route between the huts is obvious and your own judgement should be used in selecting the best micro-route around obstacles. However, if coming down the Koropuku the exit from the stream near to the hut might not be obvious as cairns are often washed away. Keep a lookout for a small overflow stream on the true right of the Koropuku that runs into a quiet watercourse overhung by low trees. It will be obvious once you enter the watercourse. If, instead, you continue in the Koropuku until it begins to drop into a gorge that is a good enough sign you 've gone too far. Be aware if travelling in the other direction that there is no guiding feature leading down to the Townsend Hut in bad visibility. Very fit trampers won't find it too onerous to do this in two days in the mid-summer months. For the first time I would recommend taking three days. And my preference is for starting with the first day into the Koropuku. I saw that the Avalanche Peak Challenge is being run on Saturday 6 March this year. The weather forecast was for snow right out onto the plains on Saturday night and Sunday. That limited the options for tramping to the front of the foothills. The Mount Somers area fits that requirement. And I hadn't been to Woolshed Creek Hut for two years so it was easily decided. Besides, I was keen to see how the new hut was settling in, and also it's always an attraction to me to be in the hills during a big snowfall. We headed out of Christchurch Saturday afternoon for the drive down and arrived at the Woolshed Creek carpark about 4.00 pm. The final few kms was through snow. Honora headed off as soon as she was ready to go. I was almost ready to follow when a car came along the track. It was a young couple just coming in for a look. It was as well I was still there as they weren't able to turn their car around with its town tyres. After helping them I was half an hour behind Honora. But that was ok as we'd walked to this hut many times before, and in the dark. The snow was a few centimetres deep on the ground. In places the trees also were still laden with snow from the last fall. Branches hung interlaced from each side and I took care not to dislodge snow onto me as I crouched by underneath. It was chilly already and I didn't want to add to it. Above the bushline the snow was deeper, as much as half way to my knees. But I was wearing my plastic climbing boots so my feet kept toasty warm. The last light faded at 5.30 pm. I was still 30-40 minutes from the hut. The snow made for slower travel than usual. I did have two torches and spare batteries so it wasn't an issue. But I diverted from the walking track to the 4x4 'Burma Road' for the easier and more direct travel. I arrived at the hut just after 6.00 pm. Honora had expected me to catch her along the way so she was concerned at my non-appearance. I hadn't thought to switch on my UHF radio when I crested the last hill before the hut and let her know I was on my way. It was something to learn from. Woolshed Creek is a very large hut. It has 26 mattresses on platform bunks, in two separate bunkrooms. The common room is cavernous compared to most tramping huts. In fact it's so large it doen't feel like a hut at all to me. But on the plus side it is very well insulated and double-glazed so once the fire was lit it warmed up quickly. And it was great having the hut to ourselves. In the morning it was snowing gently with no wind, and it didn't even seem very cold. We didn't have anything planned for the day other than the easy walk out so we just had a lazy morning around the hut. The Mount Somers Walkway Society deserve far more recognition for the work they've put in over many years to develop the tramping facilities around this mountain. This hut may have been built by DoC but it would never have happened if it wasn't for their efforts. Having enjoyable tramping trips depends on reliable weather forecasting. The biggest part of this comes from your ability to interpret the professional weather forecast in relation to the localised effects for where you are going. The best way to develop that ability is to make notes on what each forecaster says for each day into your planned trip. Then make notes on your tramp about what actually happens with the weather. Before long you will start seeing patterns that build an instinctive understanding. Before that you first need detailed weather information. You can't get this from the brief descriptions from television or newspapers. Using these weather websites, plus a good amount of 'reading between the lines', means Honora & I can go for months without tramping in bad weather. However sometimes we actually choose to go with bad weather just to make a trip more interesting (or less crowded). And don't forget the Mountain Radio Service for daily weather forecasts on your longer trips. We'd been trapped in town by bad weather for two weekends in a row, with the long range forecast looking like it might go to three. We were desperate to get out tramping in the hills for at least part of a day. But what to do when the weather was so bad? There was very little traffic on the highway to the Kaituna valley turnoff. Sheets of water stretched across the road in places. And curtains of rain were being blown up Kaituna valley by the south west wind. But we weren't deterred. Honora carried her plastic climbing boots in her pack. She wanted to put these on to keep her feet warm after the four stream crossings. It was so wet I wasn't going to bother trying to keep my feet dry. The first crossing was the deepest - it was just above my knees. We did that one linked up together for balance. The next three crossings were easier, but almost to knee level. After getting chilled crossing the streams I just wanted to get up the hill and into the shelter of the hut, so I just went for it. The top part of the track is completely open to the weather and was being lashed with near freezing wind and drenching rain, but I still arrived at the hut steaming. The hut was dry, but it was cold and we only stayed long enough for lunch and some hot drinks. Entertainment was provided by the antics of mice scuttling around. Remote huts and bivs in central Westland.